Dr. Schenk's 3D House of Satellites: Rhea's Blue Streaks - Rings and Other Things! Rhea's Blue Streaks - Rings and Other Things! 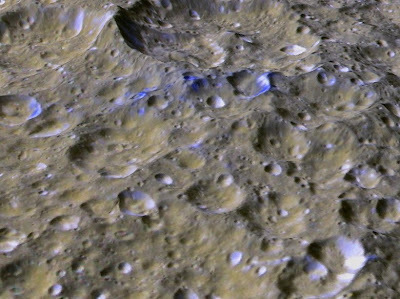 This perspective view shows one of a series of relatively blue patches that form a very narrow band only 10 kilometers wide that straddles Rhea's equator. The bluish material is fresh ice reexposed when material from Rhea's ring struck the surface along the equator, and will be a target of investigation during the March 2 Cassini flyby of Rhea. The smaller craters with the bluish deposits in the center of the frame are typically 3 to 10 kilometers wide and less than one kilometer deep. This view is looking toward the west along the equator. This view was created using stereo topography generated by Dr. Paul Schenk of the Lunar and Planetary Institute in Houston Texas from Cassini imaging data returned in 2008. The colors have been enhanced to highlight the color differences between these patches and the cratered terrains of Rhea. It's a busy time for satellites on Cassini. An extremely close pass of Rhea a scant 100 km above the surface March 2, a brush with tiny Helene the day after, and a 500 km pass of Dione in April are all coming up very quickly, close on the heels of our only close pass of Mimas, the subject of my most recent post. As posted here in October, I've been working extensively on color mapping of these moons and their neighbors and this work has now been submitted for publication at the journal Icarus. These color maps reveal a host of interesting phenomena and a few surprises, and the new data will help us understand these features better. But first heavily cratered Rhea. Going into orbit 6 years ago, Rhea was regarded as the ugly stepchild, the "Callisto," of the Saturn system. Little was remarkable about this second largest of Saturn's icy satellites, but it should be axiomatic by now that the closer you look at a planetary object the more surprises you see. The biggest surprises so far are the belt of graben fractures running north-south on the trailing hemisphere and the purported circum-Rhea debris ring reported in 2007. 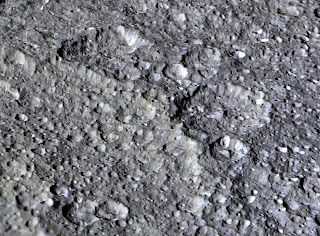 The fractures betray a degree of thermal activity on Rhea. Perhaps they are stretch marks formed when the satellite cooled and the icy lithosphere contracted, stretching the surface (though why they would form only on one side is not clear). The debris ring around Rhea is even more puzzling. In fact the discovery has been greeted with some scepticism in the ring community (ring particles are too small to map geologically so I haven't paid too much attention, until now). Unlike the main rings or Enceladus' plumes, the Cassini cameras see no glow from Rhea when it is backlit, indicating that the debris ring is not very dusty. So it came as a pleasant surprise when our group discovered the very narrow bluish streaks along Rhea's equator (this feature was also discovered independently by two other groups). We have completed the first mapping of these features and report on it in our new journal article (see my blog of October for detailed images). Although the streaks are not continuous, they can be traced over at least 270 degrees of Rhea's circumference and lie within ~2 degrees of the equator. Most likely, discrete portions of Rhea's surface have been impacted onto its surface. A further curiosity is that the blue streaks formed only on high-standing rises or ridges. In one area, for example, they formed only on the high-standing rim of a large crater straddling the equator. This indicates that the particles were in low orbit and preferred to strike the highest standing topography first. This leads us to the videos I am releasing today. 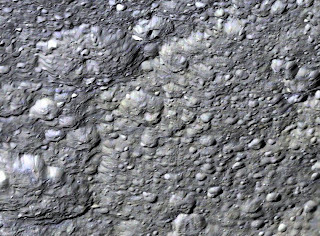 They feature the heavily cratered terrains of Rhea. 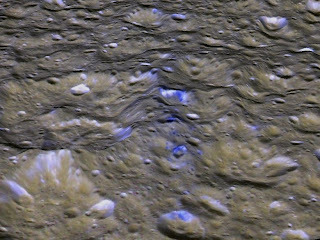 The second of these videos ends with a pass over one of these bluish features, which lies across a broad cratered ridge crossing the equator of Rhea. The nature of these patches suggests they were small and disrupted the surface, reexposing blue material. In our paper we also discuss the equatorial blue bands of Mimas and Tethys (see my preceding post this February and the post in October). Without going into too many details, we find that the patterns on both moons are almost exactly matched by the impact pattern of a particular type of retrograde trapped electrons hitting the front side of these two satellites. Yes, some particles do drift backwards within Saturn's magnetic field. We also find that the color pattern on Enceladus differs from all the others. In this case, the pattern matches the predicted fallout and deposition particles from Enceladus' icy plume back onto the surface. It also seems that the plume material blocks other particles from hitting Enceladus and thats why we do not see the equatorial bands on this satellites. Two more mysteries solved! The annual Lunar and Planetary Science Conference is coming up next week so I will be busy but stay tuned to this iChannel for more news on these bodies in the next two weeks. These perspective views of Saturn's second largest moon, Rhea, shows the western half of its second largest impact basin, Tirawa. This ancient impact basin is 370 kilometers across and roughly 6 kilometers deep. The broad arcuate scarp cutting across scene center is the battered rim of Tirawa. The floor of Tirawa, at right in top view, left in bottom view, is heavily cratered, indicating it formed in ancient times when a 30-40 kilometer wide comet struck Rhea. The two large craters just beyond the rim are 55 and 60 kilometers across. This view was created using stereo topography generated by Dr. Paul Schenk of the Lunar and Planetary Institute in Houston Texas from Cassini imaging data returned in 2008. Although enhanced, the color in this view is an approximation of what we might actually see. This view of Rhea's blue streaks is looking toward the north across the equator shows one of a series of relatively blue patches that form a very narrow band only 10 kilometers wide that straddles Rhea's equator. The bluish material is fresh ice reexposed when material from Rhea's ring struck the surface along the equator. This view was created using stereo topography generated by Dr. Paul Schenk of the Lunar and Planetary Institute from Cassini imaging data returned in 2008. The colors have been enhanced to highlight the color differences between these patches and the cratered terrains of Rhea. These brief notes are posted to help viewers understand the nature of the topographic data. Voyager, Galileo and Cassini carried imaging cameras but not altimeters. Topography is instead generated using stereo images or low-Sun images (which can be used to calculate slopes and heights). Neither method is perfect and often, as is the case for Miranda, individual stereo pairs must be constructed and then stitched back together to form a global or partial topographic map. This means that the elevations shown are not precise with respect to the center of the body. Height values derived are accurate however with respect to local features. For example, we know the steep cliff on Miranda is about 10 km high top to base but we do not know how high it is with respect to the mean "sea level" on Miranda. This cannot be determined until we return to these places. I will post additional information on the data over the next few days. Inquiries for the scientific use of the original digital elevation data should be forwarded to schenk@lpi.usra.edu. "All Good Things . . ."